In the history of the World the Paris Agreement will be regarded as an historic moment. Even though it was far from perfect and didn’t go far enough. It was part of the Paris moment for climate justice. Paris was a moral turning point. When 195 countries agreed by consensus to set a target to decarbonise by the later half of the century, an ambitious climate temperature goal and an international framework to achieve it. It signifies the turning of the tide against fossil fuel pollution, although as Naomi Klein highlights, fossil fuels is not mentioned once in the agreement. The Paris Agreement (PDF) is far from a fair deal when looked at in terms of historical emissions, and action based on differentiation and equity. It was a compromise, and the developed countries largely won their agenda, but with some political concessions to vulnerable and least developed and developing nations on the temperature goal and basic finance. The Climate Vulnerable Forum clearly won the moral argument. The French presidency of COP had worked hard diplomatically to bring this agreement to fruition. It seems the ghosts of Copenhagen have at last been laid at rest. Professor Hans Joachim (John) Schellnhuber, Director of the Potsdam Institute for Climate Impact Research (PIK) commented, “The spirits of Paris have defeated the ghosts of Copenhagen! Reason and moral combined at the COP21 to deliver a historical climate agreement that finally transcends national egotisms. The target of limiting global warming to well below 2 degrees and aiming at 1.5 degrees is more ambitious than expected, yet fully in line with the scientific risk assessment. “If sincerely operationalized, the Paris agreement will induce the decarbonization of the world economy by the middle of this century. The current emissions reduction pledges (INDCs) of most countries, however, are insufficient and have to be adapted to the new level of ambition in the next few years. Still, this is a turning point in the human enterprise where the great transformation towards sustainability begins.” said Schellnhuber. But the restrictions on political protest with the imposition of a state of emergency after the terrorist attacks of November 13 angered many. Climate Action groups decried the suppression of civil society rights to freedom of speech and public assembly on the climate issue. The real state of emergency was a climate emergency they argued. Whether we achieve the goal for planet earth is a different matter. And depends on what we do from this day forth. The future, our survival as a species, is really in our own hands. In some ways the Paris Agreement was far more than I was expecting, in other ways less so. What the goal implies, and that the science tells us, is that fossil fuels, and coal in particular, needs to be phased out by 2050. We need to transition to a 100 per cent renewables based zero carbon economy and society. All the human rights, indigenous rights, food security, gender equality is in the preamble rather than in the operative text, which, I am assured, makes a big legal difference. They have more weight in the operative text. But it is more than we had 8 months ago but less than the first drafts of this agreement. 2 steps forward, one step back. Similarly, aviation and shipping emissions, the equivalent of Germany and Japan emissions combined, have been dropped entirely from the agreement that were in the early drafts. This is a growing area of emissions. So the corporates won out on this, for the time being. But the issue has been raised, and isn’t going to go away. This is one area to watch on the international level. “While these sectors have received an opt-out from the text of the Agreement, they must not receive an opt-out from its long-term ambition. We will redouble our efforts to ensure these industries contribute to the 1.5°C target, either through measures at ICAO/IMO or at regional or national level.” said John Maggs, Senior Policy Advisor at Green NGO Seas At Risk. A major issue is that there is no enforcement: it depends upon individual action by each nation to reduce emissions and is entirely voluntary according to each nation’s own submitted plans. This was needed so that the agreement could become a legally binding international treaty, yet would not have to be submitted and pass through the Republican dominated US senate for ratification. With current climate action plans submitted by 186 nations, many of them conditional on certain levels of support, it is calculated that temperatures would increase anywhere from 2.7 to 3.5 degrees Celsius. So there is a current huge gap in emissions reduction plans and the stated goal. It is hoped that over time national action can be ratcheted up so that we do not exceed 2 degrees and aspire for the 1.5 degrees target. This year, with a strong El Nino, we achieved one degree celsius warming above pre-industrial temperatures. We don’t have much time and scientists say the window of opportunity for limiting warming to less than 2 degrees is fast diminishing. Included in the Paris Agreement is a review mechanism (Paris ambition mechanism) that each nation needs to consider and review their actions and targets every 5 years, and an expectation, but no enforcement, that plans be necessarily upgraded. A global stocktake will regularly measure progress, starting in 2018. But it all depends on voluntary action by each and every state . For Australia and other developed nations this means increasing our emissions reduction target up to 45 per cent by 2030 on 2005 baselevel, or 50 per cent on 1990 baselevel. For 2050 our emissions would need to be 80 per cent below 2005 levels. Modelling done by Warwick Mckibbin for the Australian government shows that Australia could increase it’s emission reduction targets to 45 per cent by 2030 with minimal economic impact on GDP growth, but such increases would come primarily from reducing emissions from Australia’s coal dependant energy sector. That is something currently anathema to this Government, beholden as it is to coal. 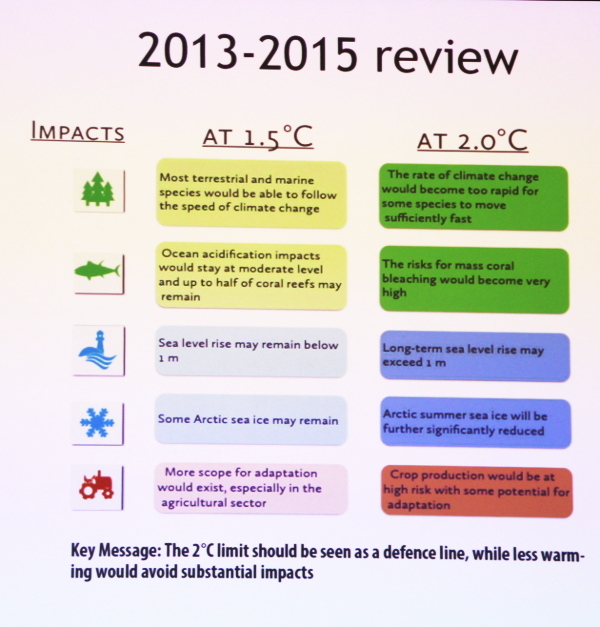 Professor Myles Allen, a professor of geosystem science at the Environmental Change Institute, School of Geography and the Environment and Department of Physics, University of Oxford, and Director of the Oxford Martin Net Zero Carbon Investment Initiative, argues at Carbonbrief that stabilising temperatures at 1.5C, while far from guaranteed, is clearly not out of the question. 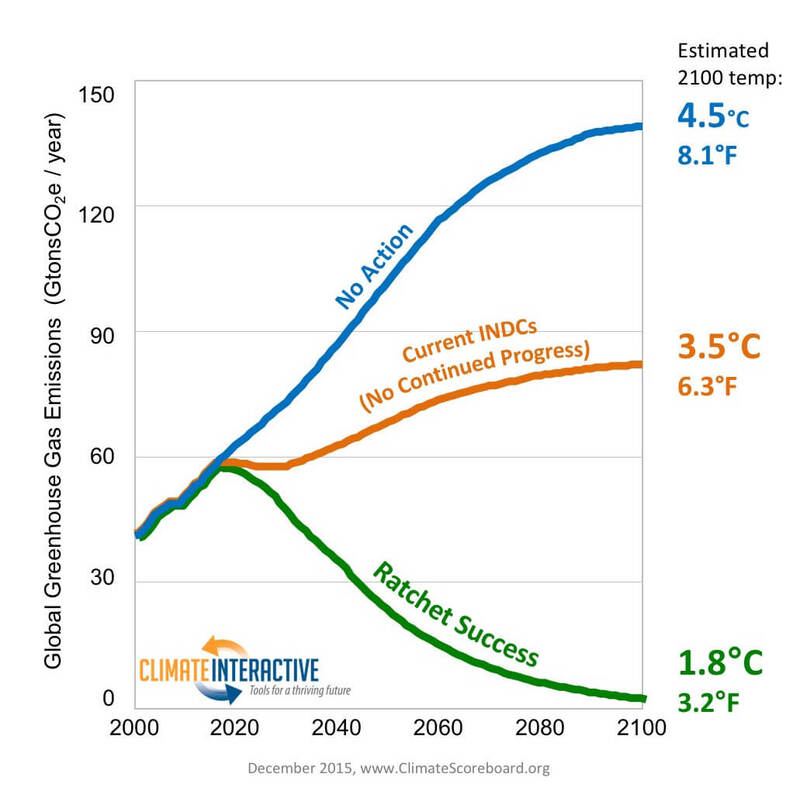 A study in May 2015 found that 1.5 degrees target is still achieveable, but only just. 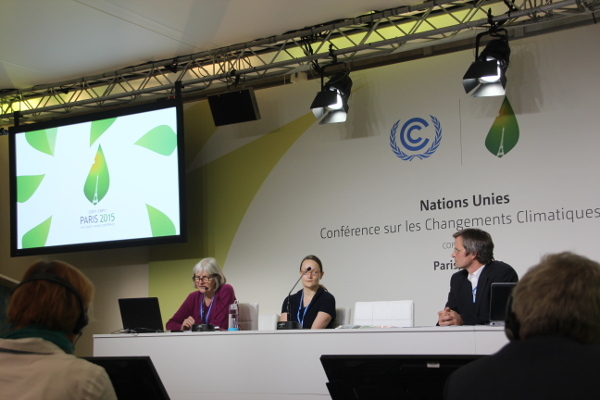 As 1.5 degrees was such a hot topic from the start of this climate conference, I attended a science background briefing on 4th December given by Malte Meinshausen (University of Melbourne & PIK Potsdam) and Kaisa Kosonen, Greenpeace senior climate expert. The decarbonisation pathways for 1.5 degrees and for 2 degrees are fairly similar up to 2030 with slightly more ambition on the lower pathway. After 2030 the ambition for 1.5 degrees target would accelerate further. For the 1.5 degrees pathway greenhouse gas emissions would need to reach net zero between 2060 and 2080, while CO2 emissions would need to be zero between 2045 and 2055. For the 2 degrees pathway greenhouse gas emissions would need to reach net zero between 2080 and 2090, while CO2 emissions would need to be zero between 2055 to 2080. For coal the future is bleak, according to the science. But it is a little bit more complex than that: thermal coal used in power stations needs to be phased out by 2050 if we are to reach 2 degrees let alone 1.5 degrees. Metallurgical coal, used to make iron and steel, may take longer to phase out as the industrial processes will need to be updated and alternatives are still in research and pilot stage. So there is room for a boutique Australian coal industry with high grade metallurgical coal, for a while. Gary Ellem at the Conversation explains why After Paris, the future of Australian coal is downhill. 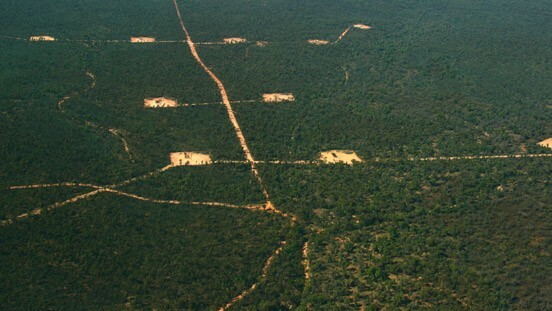 Other projects like deep sea oil exploration off Argentina, Shell’s Arctic oil exploration, or BP’s deep sea oil exploration drilling in the Great Australia Bight, should all be called to a halt. Coal and fossil fuels will continue to have their supporters in politics. 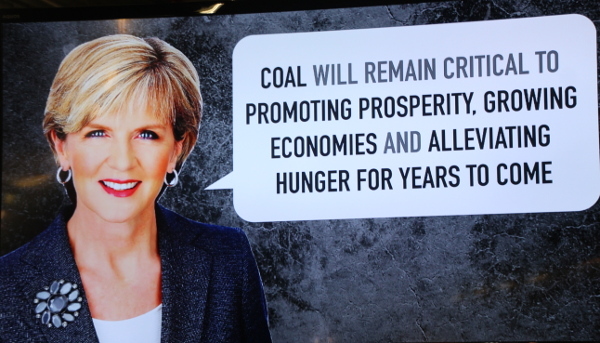 People like Foreign Minister Julie Bishop whose comments on coal at a sustainability forum hosted in the Indonesian pavillion during the COP earned Australia a fossil of the day award. Australia belatedly joined the Coalition of High Ambition shortly before the agreement was finalised, publicly announcing this in a tweet to Nofibs citizen journalist John Englart on the Friday evening. Bishop made clear shortly after the Agreement was passed by the COP, that Australians are going to have to fight for phase out of Australian coal. Politician doublespeak to say our national climate action is voluntarily determined and coal will continue as an economic imperitive in Australia under the current Government. Brian Ricketts, Secretary-General of the European Association for Coal and Lignite (Euracoal), has already identified that COP21 means that coal “will be hated and vilified, in the same way that slave traders were once hated and vilified”. Yes, the morality of digging and burning coal producing greenhouses gases causing climate change and substantial health problems is very much in the same league and morality as the slave traders. Both inflict death and human misery and deny human rights, and it is is an essential moral choice to end such practices. Ricketts could learn something about morality of coal and climate change by visiting the Nantes Memorial to the Abolition of Slavery. Brendan Pearson, CEO of the Minerals Council of Australia attempted to highlight the positive: “the outcome will support and accelerate the further roll-out of low emissions coal technologies, which can reduce CO2e emissions by up to 50 per cent.” he said in a media statement. Coal has lost it’s social licence. Climate scientist Malte Meinshausen from the Australian-German Climate and energy College highlights that the Paris agreement decarbonisation aim by the second half of the century and the temperature target implies that the electricity sector must be totally decarbonised by 2050. You can read more on this by Giles Parkinson at RenewEconomy: Hidden gem in Paris deal condemns coal to early demise. 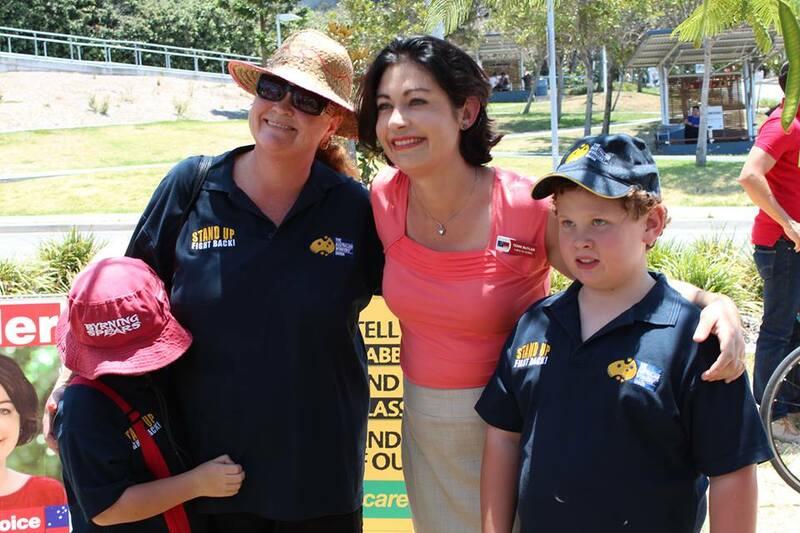 For coal communities like the Hunter Valley and La Trobe Valley we need community transition plans supported by Government. Community supervised mine rehabilitation financed by the coal companies will need to be done and will provide employment. These communities should also be among the first for consideration of new renewable projects to assist the transfer of employment opportunities. Renewables will need to be ramped up quickly, not only to replace coal power, but to enable substantial electrification of transport. We need to support the good work of the Yes to Renewables campaign in Victoria and the positive work so far of Victorian Energy Minister Lily D’Ambrosio for a Victorian Renewable Energy Target (VRET). Rollout of renewables is happening across the world, while Australia has seen policies at the Federal level to discourage investment. Lowering the Renewable Energy Target was a retrograde step. Changing the investment criteria for the Clean Energy Finance Corporation to hinder wind power investment was also poor policy, which Environment Minister Greg Hunt has only recently reversed. The fact remains that the current government policy is to abolish the Australian Renewable Energy Agency and the Clean Energy Finance Corporation at a time when they are saying innovation will play a critical part of Australia’s climate action commitment. These targets and climate policy, still being formulated by Labor, are at the bottom end of achieving Australia’s greenhouse gas emissions reduction commitment under the Paris Agreement for limiting warming below 2 degrees and are a major step up from the Government’s inadequate pre-2020 and post-2020 targets and vague emphasis on innovation as our saviour, while still spruiking the “coal is good for humanity” mantra. As Bill McKibben argues in The Guardian, Climate deal: the pistol has fired, so why aren’t we running?, we need to come up to pace rapidly. So I sit in my Paris apartment packing my bag getting ready to fly home reflecting on my Europe trip where I enjoyed record Autumn heatwave temperatures, and reflect on my time in Paris. In February 2015 Paul Gilding, former CEO of Greenpeace and a consultant on Sustainability, forecast that 2015 would be the year the “dam of denial” will break and the momentum for climate action will become an unstoppable flood. The UN Climate Conference and the Paris Agreement was part of that momentum. It reflected the change already happening in business, and the world generally, and the rising calls from the streets for action. Many businesses and corporate leaders already see the winds of change and are applying pressure behind the scenes urging stronger regulatory action, moving their money out of the deflating carbon assets market into more stable and green investments. The divestment movement has grown rapidly to move $3.4 trillion by over 500 institutions out of fossil fuel investments already. Activists were part of civil society delegations in the UN Zone, pushing, pushing. It wasn’t only the Ministers and diplomats driving these negotiations, it was being driven from the clamor of voices in the street in Paris and around the world and NGO activists observing and at their heels in the conference. 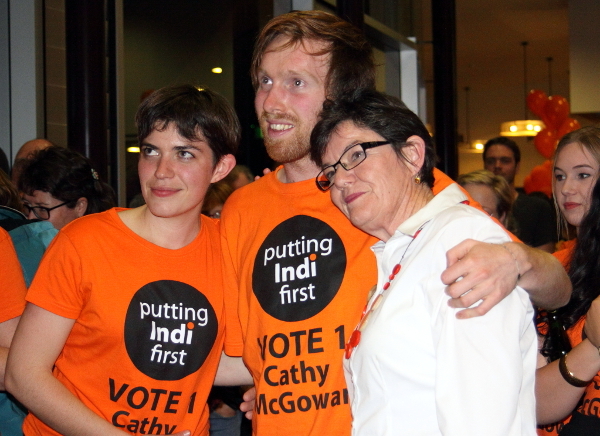 I was a small part of that as a member of Climate Action Moreland, affiliated with Climate Action Network Australia. The setback of Copenhagen has made the climate movement stronger, more resilient and possessed of greater clarity to drive change from below. Activists will use the Paris agreement, and climate science, to argue for more rapid change. They know the Paris Agreement by itself is not nearly enough. 350.org produced this video as the conference concluded as a signal that the climate movement is finding it’s voice. The fossil fuel industry should expect more disruptions to business as usual, as activists escalate direct actions and civil disobedience during 2016. European climate activists have indicated a week of action in May targeting fossil fuel assets, including the lignite coal fields Lusatia near Berlin, similar to a civil disobedience occupation in August 2015. 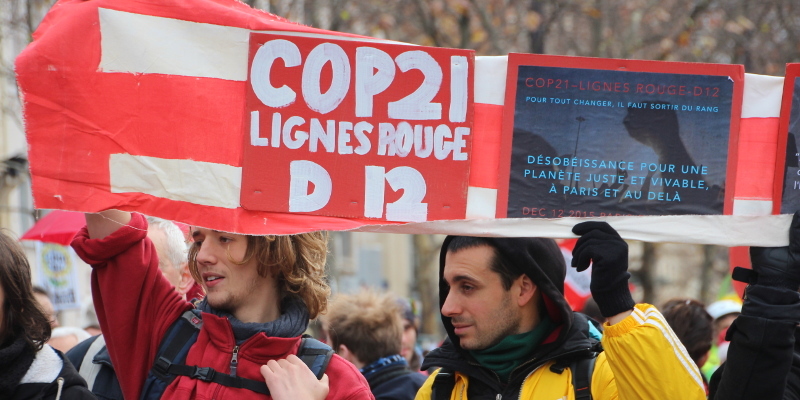 The protests on Saturday 12 December in Paris reflected the determination by activists to move forward, to drive the change and grow the movement for a safe climate future. Paris was a tipping point. The UN Climate Conference and the Paris Agreement were the tip of the iceberg. It was the Paris moment for climate justice.